The general settings page consists of a panel with two tabs where you can manage the application currencies and licence. On the currencies tab you can see a list of available currencies in your app and manage them. 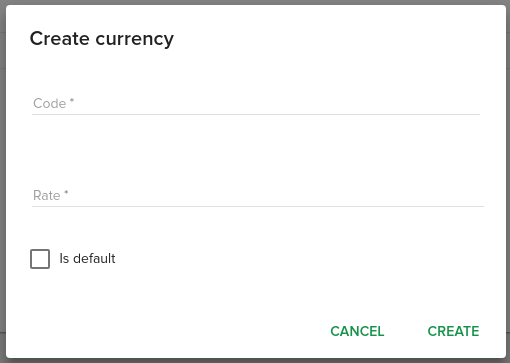 Click on the CREATE CURRENCY button from the bottom right side of the panel and a modal window will pop-up where you can add a new currency by filling some details. All currencies are reported to the default one, thus the cost of one unit of default currency is given in units of regular currency ( indirect quotation ). Use the UPDATE EXCHANGE RATES button from the bottom right corner of the card so the regular currencies will update and show prices that are equivalent to one unit of default currency. DEFAULT_EXCHANGE_RATE_CONNECTOR: The connector you want to use. Available connectors to use for now are European Central Bank connector, Romanian National Bank connector (meanwhile others might have been added). If you don’t set any value here, the default currency related connector will be used, if none was found, the ECBconnector will be used. Use their names as strings, like in the below code-block example. AUTO_UPDATE_EXCHANGE_RATES: (defaults to False). Set this to True in order to automatically update exchange rates everyday. Here you can set a new licence, refresh the current one or see details about it. You can obtain a license from Fleio. Here you can customize Fleio frontend. This page offers you the possibility to inject custom html into index.html for both staff and end user index.html files. There are 4 injection points: the beginning of <head> tag, the end of the <head> tag, the beginning of the <body> tag and the end of the <body> tag. After you added the code you want to inject you need to save it by clicking the Save button then you should click the Update frontend button to publish the changes. If you want to disable injection at a specific injection point you just need to uncheck the checkbox related to that injection point - this allows you to disable injection at that specific point without deleting code from the database. By default web browsers request /favicon.ico when loading a web page and if the file exists on the server, the browser will display it in front of your web address. Fleio comes with a /favicon.ico file and if you change that file it will get overwritten on Fleio upgrade, the same way it happens with any file that is installed by Fleio packages. A future proof method, that will be kept on Fleio upgrades, is to set your own favicon HTML tag in Frontend customization option under General Settings. Note that you can set one favicon for end user panel (End-user index.html customization section) and another one in the staff panel (Staff index.html customization section). Click Save and then Update frontend button to apply your changes. Clear your browser’s cache and refresh the page or open a new Chrome incognito mode window to make sure no local cache is used. You should see the new favicon.